Windows 10 aims to make your daily work as easy and hassle-free as possible. This enhanced comfort is to be taken with a grain of salt though: Windows 10 quite freely shares your personal data with Microsoft and certain apps. Some services protocol your entire keyboard entries, share your WLAN access data with your facebook contacts or connect your computer without asking permission to a public and potentially unprotected network. While this means that you and your contacts do not have to grapple with complicated WLAN passwords, it also poses a significant security risk. Windows 10 lets you deactivate most of the privacy endangering features manually, but not all in one place, and not especially easy to find. 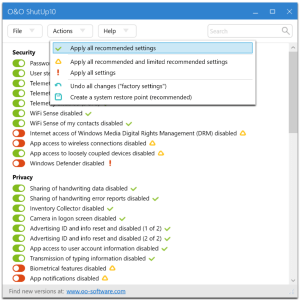 O&O Software's freeware O&O ShutUp10 means you have full control over which comfort functions under Windows 10 you wish to use, and you decide when the passing on of your data goes too far. Using a very simple interface, you decide how Windows 10 should respect your privacy by making recommendations and giving tips for which unwanted functions should be deactivated. And should you change your mind later on, e.g. giving the personal assisstant Cortana a try, all changes can be reverted with a single click. This software will let you take the full control over your windows 10 and decide which program to start automatically or which to stop forever as some of these passes your personal information to its own server or others.